Touches of world cuisine combine with seafood, American standards and one of Tahoe’s best lake views. : Location, location, location is the adage at Lone Eagle Grille. The Hyatt Regency Lake Tahoe’s flagship restaurant takes full advantage of its prime lakefront setting to offer cuisine that’s as inspiring as the view. The lounge and restaurant have plush leather seats close to the rock fireplace beneath soaring ceilings with rough-hewn beams. Putting regionally sourced ingredients center stage, the kitchen presents California fare in an ever-changing menu that balances heartier wild game and meat dishes with fresh seafood and produce. Game such as elk and buffalo are the biggest sellers, but a pairing of seared ahi, crispy tempura shrimp and briny scallops with microgreens and seaweed salad is a welcome ocean treat. Vegetarians will delight in not having to search the menu --- a dedicated one is offered, with ten options organized by course. An extensive wine list is helpfully detailed, and the knowledgeable sommelier provides tableside recommendations. Lone Eagle’s lounge is good for après-ski (or après-beach) and serves creative Tahoe-themed cocktails, pizzas, calamari and other bar-friendly snacks. 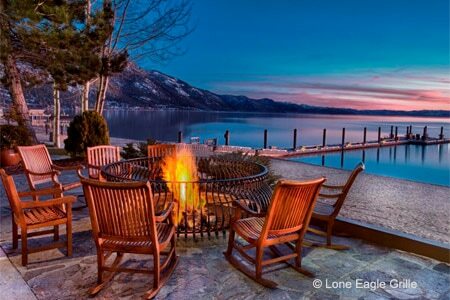 For a special experience, grab a Golden Eagle margarita and head outside to roast s’mores on the fire pit.